Christianity is a relationship with God, not a religion. The essence of religion is a set of rules or principles that their adherents have to follow. What happens when these rules are followed strictly to the expense of everything else is that it directs one to treat their relationship with God like a social club. Break the rules and you’re out. When Christians say that Christianity is a relationship with God, it implies a direct connection, association, or involvement with God. It is a holistic thing, and the focus becomes God Himself and not the rules. Rules become something God sets for us to guide us and is meant for our good, not to threaten us, or so that He has an excuse to punish us. In our daily life with our parents, if the relationship with them matters more than our self-pride, apologies and reconciliation becomes a natural thing. We then get on with life. Healthy families learn to deal with such faults in their members and it is put behind them. Bonds are not affected, and in fact, often grow stronger. Obsession over the wrongs we commit, on the other hand, hinders a healthy relationship, leading families to stop communicating, and even sometimes to break-up. So why does it become so unnatural for us to come before God, seek for His forgiveness, reconcile with Him, and move forwards or grow in our relationship with Him? Why do we still feel afraid to approach God even when we have made a genuine confession or repentance before Him? On the 20th of April, 2014, Pr Martin Steel spoke in Kingdom City church about living a new, resurrected life in God. 3 Since, then, you have been raised with Christ, set your hearts on things above, where Christ is, seated at the right hand of God. We are made right with God by placing our faith in Jesus Christ. And this is true for everyone who believes, no matter who we are (Jew or Gentile). The question is ‘Do we truly believe that we’re raised?’ In Luke 24:11-12, we see a dramatic response to Jesus’ resurrection from Peter. While the others around him were reacting to the testimony of the women about the empty tomb with disbelief and skepticism, Peter ran to the tomb, and while he didn’t know what it meant at that time, he knew it was something significant and he pondered over it. The other question is, ‘Have we left our grave clothes behind?’ Are we living changed lives and what does it mean to us to leave those grave clothes behind? Pr Martin Steel employed the story of Jesus’ raising of Lazarus, found in John 11:17-44, to illustrate this, taking particular note about Mary and Martha’s faith. In v24, when Jesus told Martha that her brother will rise from the dead again, Martha answered that she knew that Lazarus will indeed rise again in the resurrection at the Last Day. In v32, when Mary saw Jesus coming, she did not know the reason why and cried out that if Jesus had come earlier, Lazarus would have been saved. Pr Martin explained that the women had faith, but their faith was out of time. Martha had faith for the Future, and Mary had faith through the Past. Many Christians live their faith in this way, but we also need to look in the Present. Faith is a daily thing. One of the commands of Jesus after He had raised Lazarus was for the grave clothes to be removed. Sometimes, as Christians we may be born-again, but we still wrap ourselves in our grave clothes. These grave clothes can take the form of past baggages such as shame, regret, and fear. When John encountered God in Patmos, he looked into the fiery eyes of God (Revelation 1:14) and it changed his whole world. God gave him a vision of much more. Often, as Christians, we always say that we want to have the fire and passion for the things of God but we struggle with our flesh. Pr Martin says that one look into God’s eyes, and that fire will come instinctively. When we encounter God face to face, it will change our world. He also shared a passage from Zechariah 3:1-6 about a vision of Zechariah. The strange thing is that satan was there before the high priest Joshua and the angel of the Lord (v1). If we understand the book of Zechariah, this vision was part of a series meant to console the Israelites that God had been working in their lives even when they had not realized it. It was also meant to give Zechariah an insight about what God intended to do for and through the Israelites. Sometimes the closer we get to God, and the more God intends for us, the devil will also try to get closer to us. The devil will try to intercept us by throwing condemnation, and quoting the Old Testament out of context to our minds, diverting us to our own efforts to appease God instead of focusing on Him. Hebrews 10:4 says that it is impossible for the blood of bulls and goats to take away sins. Only the Power and Grace of God can do so. The day of the Resurrection had multiple significances. It was also a Day of Celebration, a Day of Freedom, and a Day of New Life. 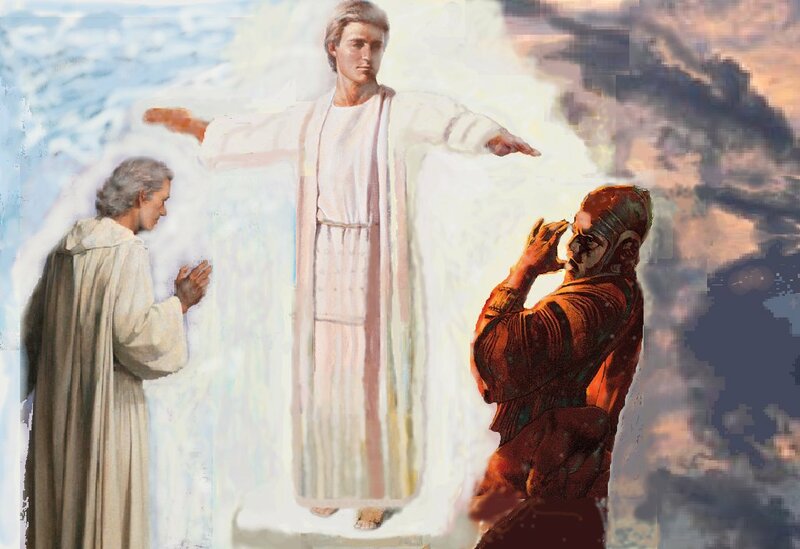 When the disciples saw Jesus after Easter, they at first could not recognize Him in His Resurrected Body, and Thomas even tried to demand proof of Jesus’ identity. In 1 Corinthians 15:42, the Bible says that the resurrected bodies God will give us are imperishable ones. Through His act on Calvary, Jesus set things in motion and sees us with a resurrected body. Do we still see others in a condemning manner as hopeless sinners, or do we see them as Jesus sees them; as souls meant to have a resurrected body? Jesus died for our sins on Calvary. When we come to God out of a genuine response and repentance, the Bible says that not only did Jesus forgive our sins; even humans can forgive the sins of another but it does not necessarily have a spiritual significance. 1 John 3:5 and the powerful Psalm 103 tell us that Jesus took away our sins, bringing with it the connotation of separateness from sin. Micah 7:19 tells us that God has compassion for us, and that He throws our iniquities into the depths of the sea, making it irretrievable. In two different places (Isaiah 43:25; Hebrews 8:12 and 10:17), the Bible tells us that God remembers our sin no more. Since He is omniscient, it indicates the conscious Will of God. That is the amazing Grace He has for us. Only God and Jesus can do this for us. Sin is a serious business, but we shouldn’t treat it in a legalistic manner and with the wrong spirit. We shouldn’t obsess over those that have already been forgiven by God, letting them fester into fear and condemnation, and separating us from Him. Sin is what separates us from God, and if we truly love God, it would disturb us. That is the proper aim of repentance; to make things right with God so that our relationship is restored with Him. Daily, make this relationship right with God and then move onwards in the manner He means us to be.